I’ve been asked how I keep information straight in my books. * Sunday services at JP’s church begin at 11 a.m.
* Palmetto Club members Selma Brewster and Essie Baldwin have been engaged in a long-running feud. * JP’s landlords do not own a pickup truck. * A city park frequented by JP is J.M. Qwilleran Park, known as Qwill for short. * Lydia Murray calls her mother Mom. * Jennifer O’Hanlon is almost 5 feet, 6 inches tall. Those are six of hundreds of facts small and large that I’ve pieced together during the writing of the JP Weiscarver Mystery Series. They’re all together in one large file that grows with each story. For example, in the next book, JP will shop for a new vehicle at Lucky Landlubber Auto Park. The reason I do this is probably understood by most readers of my books. While murders are not comprehendible to most of us, I want the elements of my stories to be believable. Part of that is the result of restraint on my part. My wife and I recently saw the movie “Mission: Impossible – Rogue Nation” and I enjoyed it, even though the implausibility of the chase scenes and fight scenes turns what might be a believable story into one most of us would never consider as possible. I do not want anyone to think, “That would never happen,” while reading one of my books. Another element of my believability mission is to not refute myself. After I wrote in “The Reporter, a Ferret and a Hurricane” that JP lives in a house at the corner of Dolphin Street and Oleander Drive, if I come back in a later story and say he lived on Swamp Street, someone will catch it and that detracts from the story. Many of my notes are about things that have not yet appeared in a book. One example is JP’s birthday. To calculate his age from book to book (even though it may not be mentioned, I want to track it), I decided a birthday was needed. It’s in my notes and may appear in a later book. While writing “The Reporter and the Sloth,” I found an additional challenge as the story hit the trail with JP and 14 people we had never before met. Each of his hiking buddies needed some background information and I started off by adding them to my note sheet, but there was an added challenge. I know from hiking with groups of people how we settled into a line and how proximity determines to some extent who you talk with. 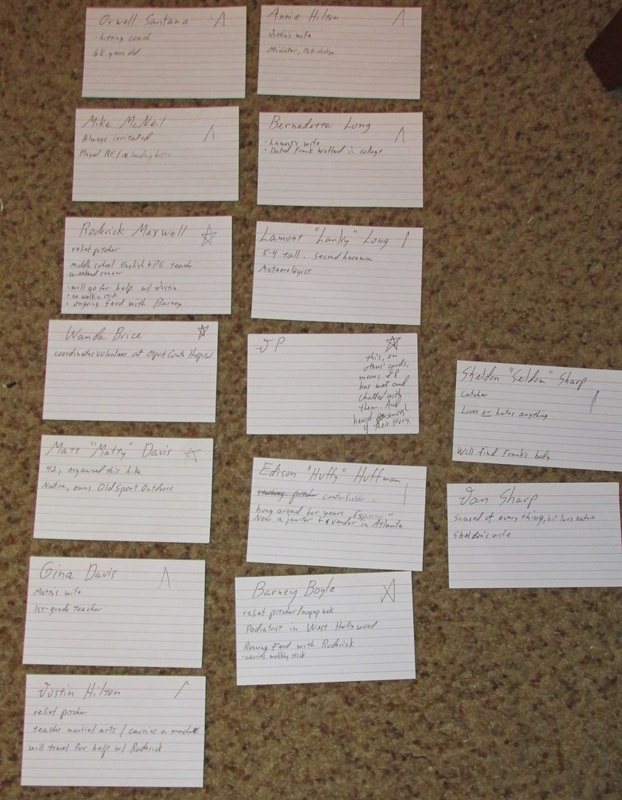 So, I made index cards for each character and lined them out on the floor to show who was where on the trail, as seen in the photo above. As the story progressed, they changed positions so JP could talk with each of them. Also, I could control who more likely heard a comment or would enter a conversation. One final thought about why I keep such comprehensive notes: I don’t remember it all. I know we met JP’s neighbors, but the fact their names are Jason Nash and Tim Grayson is something I must have written down.